At JFK, we stayed on the ground for 2 hours waiting for clearance to take off to Detroit. I was not happy with going to Detroit after the long trip from Seoul. And then I had to walk a long way from from one gate to the other…. 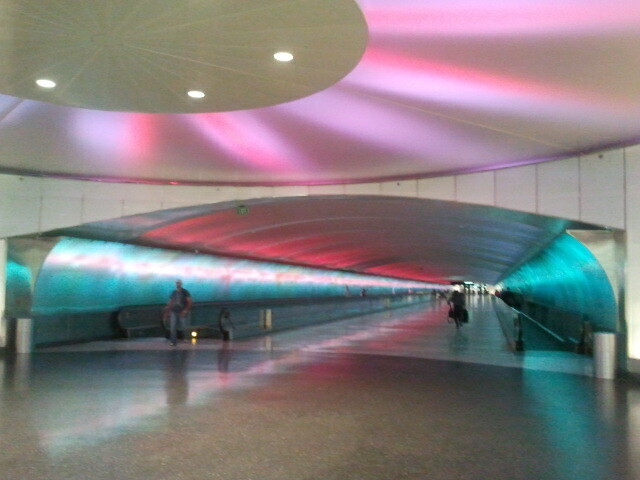 they do have a nice tunnel at the Detroit Airport which connects the terminals. So my last flight of this trip was in a little corporate-type jet, on a clear night across New York State to Albany. It was smooth and the views were incredible, I got to see many NY State cities on a brilliant night and it was a perfect way to end my trip. My sister Joanne picked me up at the airport. We stopped at many cities on the way to Providence, Rhode Island. Another bus to Hyannis, then another bus to Wellfleet. I was happy to see my trailer was still there. And now I need to clean it up and get comfortable for the summer. One of the first things I did was to put my Amazon hammock up and ready for a long relaxed summer (I hope).